Recruiters only give your resume 20 to 30 seconds of air time before moving on to the next candidate—that is, if they even see your resume at all. The black hole known only to job seekers is officially referred to in the recruiting world as The Applicant Tracking System. This effective recruiting tool allows recruiters to be quite more efficient with their time, but frustrates job seekers daily. So how can you beat the system, entice the hiring manager to look a little longer, maybe even pick up the phone to learn a little bit more about your qualifications? I’ll tell you: Stop making these top 8 resume mistakes and set yourself apart! The best example of this is the administrative assistant in our office. Yes, she, like many assistants, answers phones, files paperwork and makes copies. However, it is the way that she answers the phone and files the paperwork that sets her apart from every other administrative assistant. She is courteous, goes above and beyond to make our clients and employees feel comfortable, and even expresses empathy and solves problems before handing off the phone to the appropriate person in the office. Now that’s customer service! Rewrite your job tasks to reflect the Challenge with which you were faced, the Action you took, and the Result of your actions. Think C.A.R. Do we really need to continue to talk about this? Unfortunately, YES! Microsoft Office has made making mistakes and typos easier than ever. You heard me right – more mistakes. Here is a list of blunders we saw recently: Floor Stalker vs. Floor Stocker; Create and Barrel vs. Crate and Barrel; or steal can vs. steel can. Don’t get lazy. 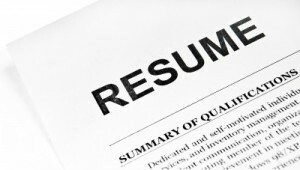 Re-read your resume and check for misspellings and grammatical errors. Don’t be afraid to get out the thesaurus and write with creativity. Sentences that all begin with “created,” will not demonstrate your creative nature. You think this would be a no brainer but it’s true – you must include your telephone number and email address. Also, replace your mailing address with your LinkedIn URL and Twitter handle. Get to the point in 2 pages and only include relevant accomplishments to the job to which you are applying. With that said, don’t sell yourself short with a 1-page document either. If you are an accomplished manager or executive, you have enough experience to draw upon that will demonstrate that you can get the job done! There are two main complaints that we hear from career transition services candidates on a daily basis: 1. I submitted my resume and didn’t hear anything back and 2. Do I really have to customize my resume for every job opening? These complaints go hand and hand. YES – you have to customize your resume for every job opportunity to ensure that your resume gets past the Applicant Tracking System (a.k.a. black hole). Without key organizational terms in your resume, you will be guaranteed a spot in the deep yonder. Take the time to use the organizational lingo throughout the resume and adjust your accomplishment (C.A.R.) statements to mirror the job requirements. Remember, tailoring a resume will not be such a daunting task if you are applying for jobs in which you are actually qualified to do. You want to differentiate yourself from every other job seeker and be unique. However, there is a limit to the amount of personal information that you should share on a resume. Teenagers would call this TMI (too much information)! Keep personal information on your resume if it aligns with your qualifications for the job and in the end could make you more marketable in the culture. Don’t use your resume as the only marketing tool in your tool belt. Get out into your community and NETWORK! Meet new people and learn about opportunities that may not be posted on a job board. Network through LinkedIn, Twitter and other social media tools. Tell us — what resume mistakes have you either made or have seen made?